Janice Gary never walked alone without a dog by her side. But it wasn’t always that way. She didn’t distrust solitude when, at nineteen, full of bravado and naiveté, she headed out west to fulfill her dream of becoming a rock star. In the heady days of women’s liberation and the post-hippie revolution of the early 1970s, she believed she could do anything, be anyone. But all of that changed in the course of one horrifying night, when she was attacked and raped on the streets of Berkeley. Forget the big dreams—now, her only goal was to make sure what happened in California never happened again. Unable to walk alone, she adopted a gangly stray pup with biscuit-sized paws and named him Barney. But after Barney was attacked by another dog, he became extremely protective, making it difficult to have him around other dogs. So it became for Janice nearly impossible both to go out without Barney and to go anywhere with him. Then, after years of being a prisoner to her fear and Barney’s defensiveness, Janice risked taking Barney to a park near the Chesapeake Bay. There, she began a remarkable transformation that allowed her to step out of the self-imposed isolation that held her captive for three decades and into a world renewed with possibility. 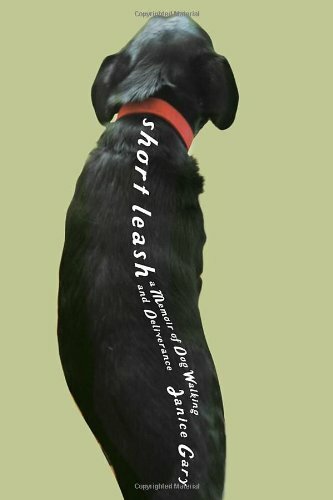 Short Leash tells her story. Janice Gary’s writing has been featured in numerous journals and anthologies. She holds an MFA in creative writing from Goucher College and is a fellow at the Virginia Center for the Creative Arts. This was a powerful and insightful book that will make you have a wide array of emotions flood through you as you read. You get drawn into the story not only because of what happens to the author, but because of the true human nature and dynamic that is shared in this story. Ms. Gary shares intimate details of her life and you will connect to her through her courage and spiritual re-awaking that she goes through. If you are an animal lover you also will be drawn in by the connection of the author and her dog and how this special bond helps to heal both in the end. This is the type of book that you don't want to put down and the author did a great job at creating a story that is important to share too!